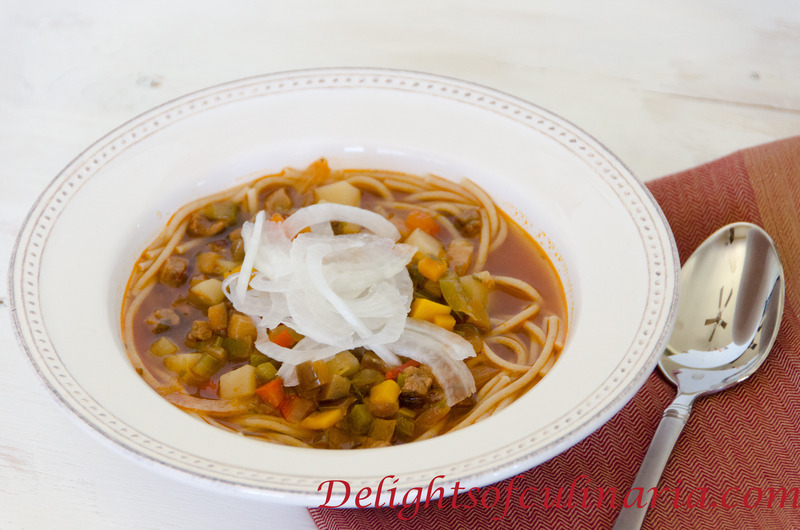 Lagman is a beef (lamb) vegetable noodle dish. Its one of the several Uzbeks signature dishes along with plov,manty, samsa and kebobs.There are different varieties of lagman ranging from using different kind of vegetables, meats and noodles.It’s one of my favorite childhood dishes that passed on to my family. In a heavy pot, heat oil on high heat.Add meat.Season with salt and pepper. Cook until meat is well browned. Add the onion, cook for 2 minutes. When the veggies are softened, add potatoes cook for 2 minutes, stirring occasionally. Add tomato sauce and bay leaf.stir and cook for 5 minutes. Throw in eggplants,cumin,chilli pepper, salt and pepper.stir, cook for a minute. Add water and close the pot with a lid and bring to a boil. When boiling reduce heat to low and cook for 12-15 minutes. Throw in the fresh herbs and garlic. Close the lid and let it sit for 15-20 minutes before serving. Add thinly sliced onions on top and pour the soup over the spaghetti and onions. Add a pinch of chilli powder or red pepper flakes if you like a little heat.